This is Tamar's favourite picture of the girls at swimming this season, they have only just started back. 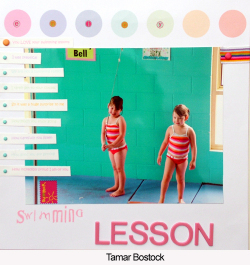 Tamar's journaling reads "You love your swimming lessons, I was skeptical, we are not a swimming family, I rarely get to your classes, So it was a huge surprise to me, how much you enjoy going, how good you are getting, and how carefully you listen. I'm incredibly proud of you". Tamar doesn't usually scrap using large photos but she couldn't resist this one. She loves the combination of the blue walls and colourful swimming costumes stripes. Tamar has used the Carolees Creations rub-ons from the For Keeps onsert straight on to the photo. They are really lovely rubons and go on easily. Tamar has also used the "enjoy" along the patterned circles of the SEI paper. Tamar wanted simple journaling so she has used strips coloured in Microsoft Word and printed onto photo paper. Just as Tamar finished with the brads Talia came in to help. She insisted that the top brad had to be orange not blue and made Tamar take it out and change it. When Tamar asked why she said it's my favourite colour and silly it matches those pretty letters up the top and the orange circle - that's why - just do it ok mumma! Autum is kind of a non-event season for Caz and her family. They have native plants so there are no trees to drop big piles of leaves for the kids to play in. It's nice to get out though when it has cooled down and go for walks. Caz loves this picture of her daughter Jordan and her friend Will. Of all things they were disscussing how soft cats faces were - how cute. 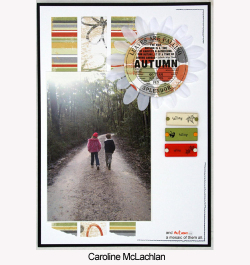 Caz used the Junkitz earth floral and earth skinny stripe papers to tie in with the photo. BaiscGrey Autum Black rubons were added to the Junkitz double-playz and secured to the page with brads. The large BasicGrey rub-on was added to the earth dots paper and then cut out to form the centre of the daisy. Caz used the Carolee's Creation onsert from this months FK to add the last line of the poem to the bottom of her page. For this layout Rach wanted to create a real spring feel, which just bursts "spring" but she didn't want it to be titled 'spring'. So Rach used bright spring colours and stamped lots of different flowers using the Carolees Creations acrylic reflections stamps onto white card. To get this effect, colour each of your flowers using watercolour pencils, then use a fine brush, add a bit of water to each and the colour becomes so much more vibrant, but also much smoother. 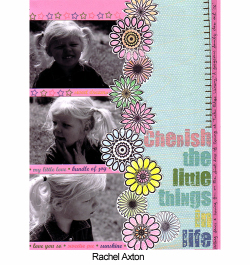 The stitching, title and words & stars uunder the photo are all rub-ons, most coming from the cherish life pack. 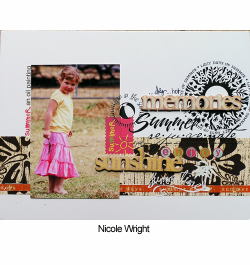 Nic has chosen summer as her theme from this first lot of seasons layout. Summer for Nic means hot and dry days - a chance for outdoor play and adventures. Nic has used a mixture of rub-ons to create this layout - BasicGrey Black summer rub-ons, with Heidi Swapp Corner rub-ons, as well as the Carolees Creations onsert Season rub-ons from this months FK magazine. Nic has added the rub-ons in a collage effect, and over the top of the Heidi Swapp tape - which the rub-ons attach to quite easily. Nic has then added over top the small vintage words from Li'l Davis. 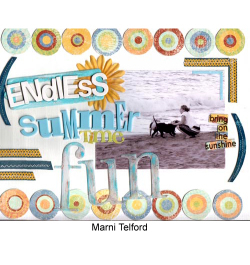 Since moving to Mackay Marni and her dogs spend a lot of afternoons at the beach and as summer is fast approaching she knows that as the weather heats up the beach is going to bring endless fun this summer. Marni cut some circles out of a piece of Carolee’s Creation’s paper and mounted each one on chipboard. She sanded around the edge of each circle to keep with the distressed look and created a border along the top and bottom of her page with them. Marni’s titles other than the photo are always the main focus on her page which means she has to use a lot of different lettering to keep each page looking different. On this page Marni has used lots of different lettering including the large Heidi Swapp ghost letters. To keep with the distressed look of the paper she sanded them roughly and then swiped paint over them. Marni also used a Heidi Swapp mini flower to mimic the sun in the top right of her photo. Mel's daughter Bella is an outside girl, so when the rain comes, and all she wants to do is go outside and jump on the trampoline. She sometimes just sits at the window feeling sad. Mel calls it the winter blues. 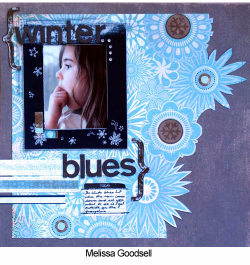 Mel has used the Heidi Swapp Winter frame kit combined with the BaiscGrey Gypsy patchouli pattern paper, which was perfect for this photo which has wintery feel. Mel sanded the edges of the navy frame from the kit . The rubons and jewels provided the finished look she was after.